pishtech.com • View topic - Attention..Biggest Fish Prize Added.. Five Days To Go! Attention..Biggest Fish Prize Added.. Five Days To Go! According to my calendar we have five more days to go on the Nelson Spring Creek Mini Challenge. To reward you guys for fishing your hearts out I have decided to add a last minute "Biggest Fish Caught Prize". The rules are simple, the biggest fish caught while fishing the Nelson Challenge will win. Let me explain the details. 1. The fish must have been caught during the Nelson Challenge. In other words, not while free fishing. 2. To win you must submit the biggest fish caught code together with the Nelson Challenge score codes. Enclosing a picture is optional but it would be great if you could do that as we can all see the big fish caught. 3. 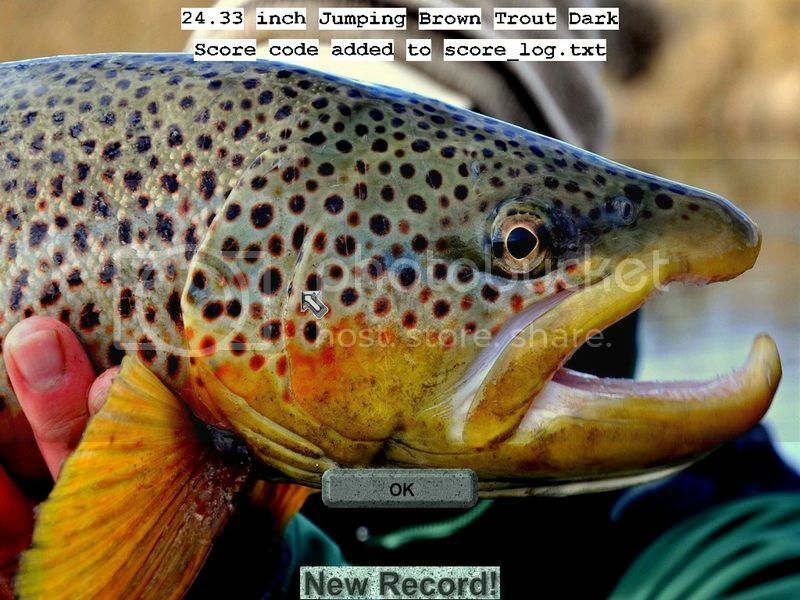 You can go back and check your Nelson Challenge records and use which ever biggest fish that you have caught, provided the fish was caught as a part of the Nelson Challenge and the caught code submitted with that fish in it. PLEASE NOTE: One member can only win one of the two prizes. If the same person had the best Outing Challenge score and also the Largest Fish Caught, the second prize will go to the person with the second largest fish caught. This way we can have more than one person winning the prizes. This is the really fascinating part about our RWFF software and Tournament Challenges. In most other RWFF tournaments you would want to catch the biggest fish possible as this will increase your overall score. But in the Nelson challenge the big fish might actually be a detriment to your final score. I caught a nice 24+ inch Brown Trout a couple of times and ended up with a lower score due to the lost of time bonus points. In a very closely contested tournament the extra 100 points means a great deal...probably between winning and finishing 5th or 6th. After competing in some of our previous tournaments, you probably couldn't get very excited about catching a Brown Trout in the 24-28 inch range. Using heavy tackle the fish will not be allowed to fight and it would have been a ho-hum reel in. However, using the right size tackle for this same Brown Trout, it becomes a real tiger and all you can do is hang on and pray that you don't run out of line and backing. What a big difference! From everything that I have seen from your posts you guys are having a good time fishing this outing and competing with each other in a most gentlemanly manner. My congratulations to everyone for their fine efforts. Five days to go now. Get that high score, or get that big fish if you can. There are a few 28 inch Brown Trout in some of the scenes. Use your fishing knowledge to find them! They are where the big trouts are usually found! Good luck and tight lines everyone. Re: Attention..Biggest Fish Prize Added.. Five Days To Go! I know you have been unusually busy taking care of your parents and their house so please do this when you find a little free time. Everyone here really appreciates your help on keeping the scores and standings. My hat is off to you for doing this when you are so busy these days. A BIG THANKS! Instead of you trying to find the biggest fish caught scores through the maze of previous submissions, why not let the competing members find them by themselves, and post them on this thread? I am sure this will make life a lot easier for you. C'mon guys, just go to your "score_log.txt" and find that big fish and the caught codes and post them here! Thank you for your kind cooperation! Stanley thank you for this beautiful outing . Thanks for getting the ball rolling on this competition. Very Nice fish and Savi is now in the lead. Let's see if our seasoned RWFF fishermen can come up with something a little bigger! Old Boston Bob has been quiet but might come back with a nice surprise like he did in our last tournament. Last edited by rwwalleye on Wed Jun 25, 2014 2:05 am, edited 8 times in total.